SAN MARCOS – Soon, San Elijo Hills will no longer be so out there. A new road that will bridge the gap between the southern end of Twin Oaks Valley Road and San Elijo Road is expected to open by late July. Access into the 3,400-home development and the rest of southwest San Marcos is limited now from inland North County. Motorists must take either San Marcos Boulevard or state Route 78 to southbound Rancho Santa Fe Road into Carlsbad before heading east on San Elijo. But once the 1.6-mile connection opens, the route will no longer be so circuitous. Drivers will be able drive south on Twin Oaks Valley Road to San Elijo. 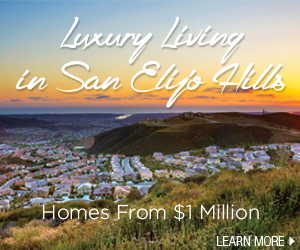 San Elijo Hills residents will be able to reach central San Marcos much faster and can do their shopping and dining in the city instead of heading west to coastal cities. That’s something San Marcos officials have wanted for a long time. From a public-safety perspective, sheriff’s deputies will be able to respond more quickly to incidents in southwest San Marcos, said City Manager Paul Malone. “It’s a heck of a long run to get there,” he said.